The collection is kept in different shades of brown going from chocolate brown to café au lait. I find that the steel blue pieces are a good contrast to the brown ones. Adding some life to the overall picture. The patterns ads to the dynamic of the collection with lines, squares and dots repeating themselves in different ways. It´s a mix of Danish and German pottery. Wow, beautiful photos Birgitte, love the lamp and also the German? piece with the chattered pattern. Thanks, Ray. If you are thinking about the large round one in the middle, then you are right. It´s German. As well as the two on each side of it. But the stamps are not revealing more than that. Love the colors you chose to collect! 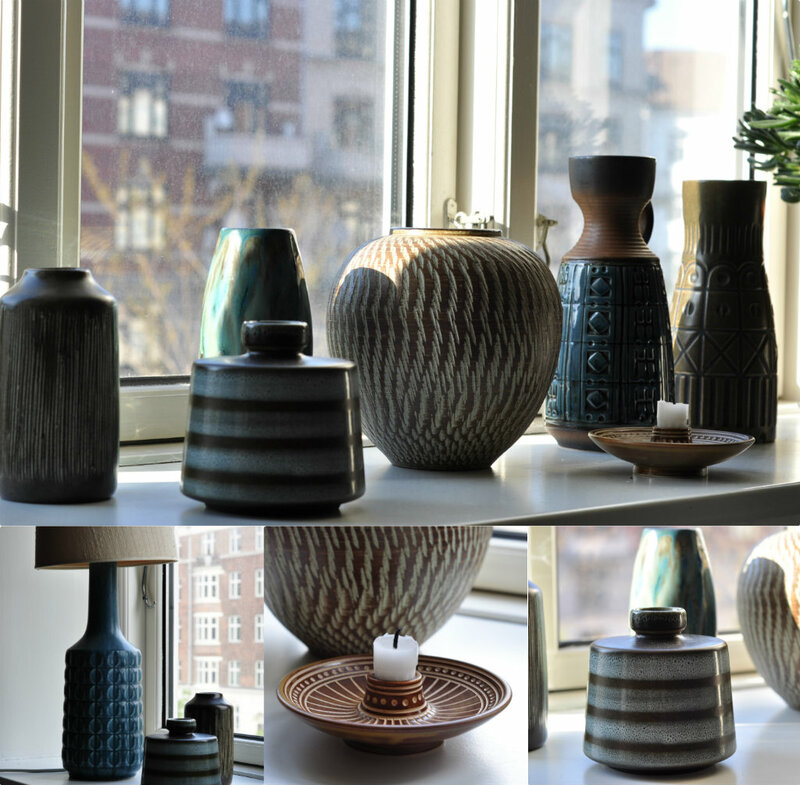 I think that the striped vase is my favorite- great colors and pattern! Det ser ut til å være særdeles gode vekstvilkår i din vinduskarm, Birgitte:-) Nydelig samling, min absolutte favoritt er nr 2 fra høyre (av de to bak lysestaken er den lengst til venstre) Vet du hvem som har laget den? Den ligner en vase mine foreldre fikk i bryllupsgave av en dansk venninne. De er superflinke sammen, lekre farver! !